In Windows 8.1, 10, 2012 it´s easy to create a password reset disk! Here is the solution to create a password reset disk for Windows 8 and Windows 8.1 , Server 2012! Open the "User Accounts in Control Panel" start the Windows-8 RUN command dialog, with the key combination [Windows-Logo]+[R] and enter the command "control.exe /name Microsoft.UserAccounts"
... How to switch the Windows-8 Control Panel to classic?. 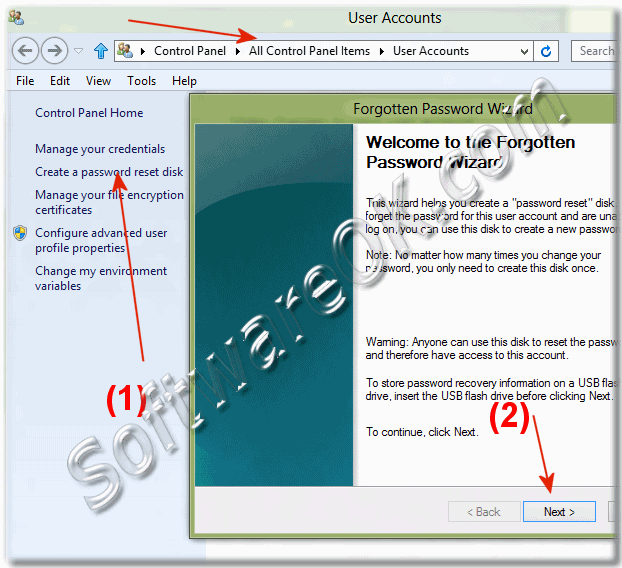 Forgotten Password Wizard in Windows-8! In the "User Accounts in Control Panel" click on the link "Create a password reset disk"
This will open (start) the "reset disk wizard"! The "reset disk wizard" helps you to create a "password reset" disk. If you forget the password for this user account and are unable to log on, you can use this disk to create a new password. Make sure the disk is still in the drive, and then type the current user account password. If the account does not have a password, leave the box blank.